Like most common names, "Iron Blue Dun" can refer to more than one taxon. They're previewed below, along with 6 specimens. For more detail click through to the scientific names. These are very rarely called Iron Blue Duns. This is the best Spring hatch after the Quill Gordons (Epeorus pleuralis) but before the Hendricksons (Ephemerella subvaria) in most parts of the East, although it can overlap with both. 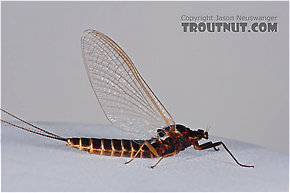 The Blue Quills are small mayflies (hook size 16-20) but they can hatch in incredible numbers at a time when eager trout are just beginning to look to the surface after a hungry winter. 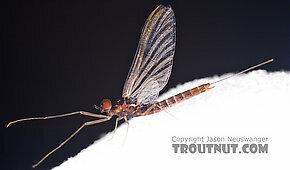 Male Paraleptophlebia adoptiva (Blue Quill) Mayfly Spinner View 7 PicturesBased on the pale longitudinal forewing veins (excepting the costals), dark middle terga (Tergum: the dorsal part of an abdominal segment or segments (terga). 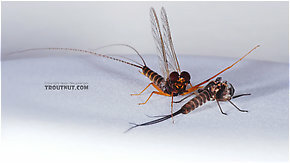 Also used to describe the entire abdominal dorsum or the thoracic dorsal segments of Odonata. ), and genitalia (Burks '53), this specimen is P. adoptiva. 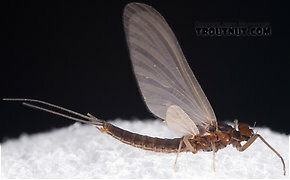 Most anglers encounter these large mayflies every Spring in the East and Midwest. 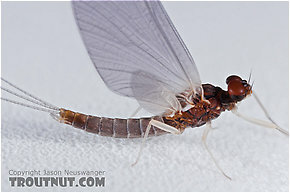 They are omnipresent in small portions, providing filler action in the days or hours between the prolific hatches of the early season Ephemerella flies. 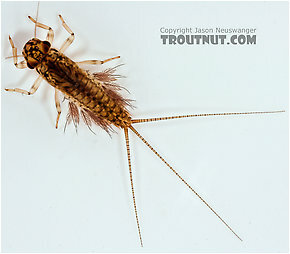 See the main Leptophlebia page for details about their nymphs, hatching, and egg-laying behavior. This is by far the most important species of that genus. This species often emerges together with Paraleptophlebia strigula and Paraleptophlebia guttata, and the combined effect can be a good fishable hatch. The latter two are much less famous than mollis, but Knopp and Cormier say they are more reliable.